I am appealing to the collective tech once again. 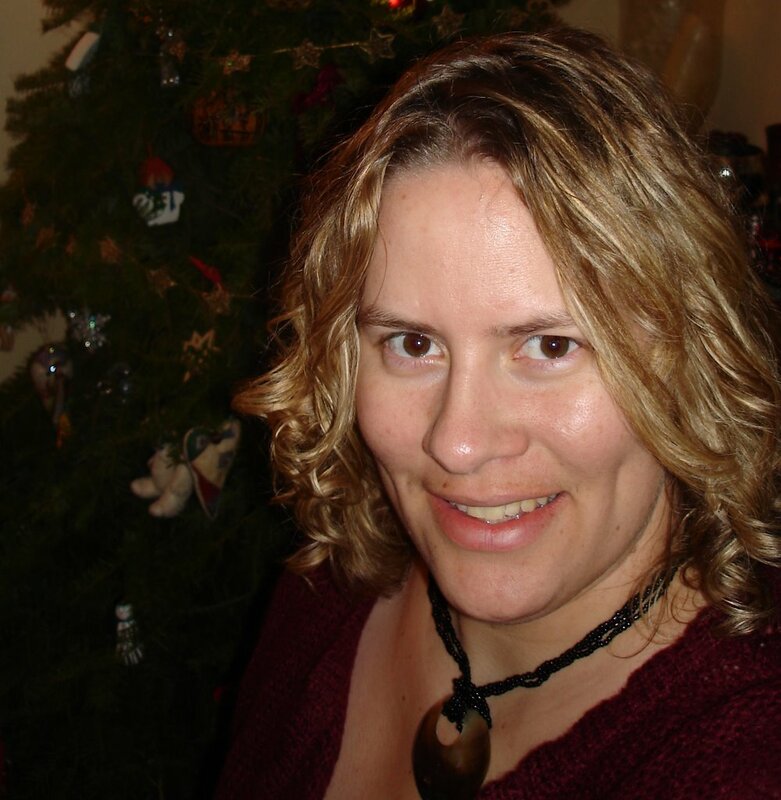 I switched my blog over to the new Blogger and I'm right back to an issue I had with the old Blogger -- how do I keep the blog title from pasting itself right across my header without also removing it from the page title in the browser (and also in my profile)? I managed to get the graphic itself back in by recycling the code from my old template. I know there was a way around the text-over-graphic thing, but the last time I edited my template was about two years ago. (I know...) I do have a new header graphic to put up but it's not quite ready to go yet, still needs some tweaking. Any ideas? Helpful hints? Backdoor code? 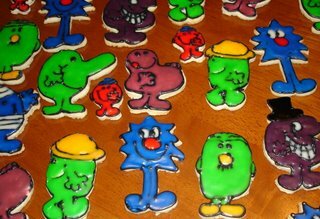 Many Christmases ago when I was a little girl - 5 or 6 I think - I received a set of Mr. Men cookie cutters for Christmas. Who could have guessed that all these years later I'd still be playing with them? 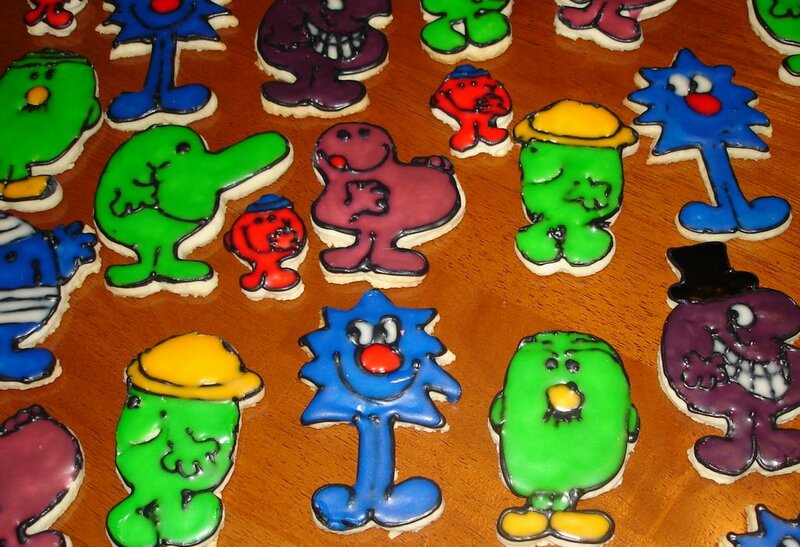 I have no idea how many times I have made cookies with this set but one thing I always wanted to do was to outline the details in black and do fancy run-in work to ice in all the colours. I can remember my Mom saying many times what a lengthy process that would be and suggesting straight-up buttercream icing as an alternate. My Mom, as I have long known, is a wise woman. But this Christmas I decided to take the long route, just for fun. In news of a Christmas decidely more recent I am delighted to have spent another wonderful Christmas with my other family. It is an amazing thing to be able to spend Christmas with people on whom you have no claim -- in blood or the law -- but who have invited your into their hearts willingly. What a great way to acquire extra family. There were aunts and uncles, cousins, nieces and sisters, presents and baking and puzzles. The TV was off for three days straight and no one noticed. Merry Christmas indeed. 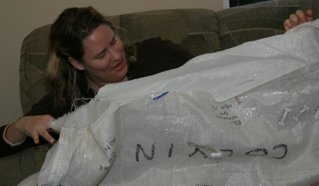 For my parents, here are the photos of me opening the enormous present you trekked most of the way across North America for me. It was so big we'd nicknamed it "the giraffe" but it turned out to be even better than that. Imagine you remembering on your far away holiday that my old hammock had finally given up the ghost. I can hardly wait for the weather to clear up enough to go and hang this in the backyard. I have just the right spot. Could there be anything better than a shady spot with a hammock to read in? First of all, Merry Christmas! Can you believe it's the 23rd? As my brother would say when we were growing up "it's the Eve of Christmas Eve!" We were big Christmas celebrators at our house. All the decorations had to go up each year, we baked the cookies and used every cookie cutter Mom had cutting them out. Then we'd spend all afternoon decorating. Good times. Who knows which of us will online in the next day or two so in case I'm not, or you're not let me give you my Christmas greetings now. May you see all the reasons you have for your heart to be bright. And for the ones who live farther away than I wish you did, know that I hold you in might heart even if my arms can't quite reach that far. You may be wondering what all this has to do with an accidental manicurist, well not much so far so let's take care of that. I learned a lesson in the importance of clear communication today. Kendra and I headed off to our favorite Manicure place to get some fancy nails for Christmas. Traditions come in many forms. 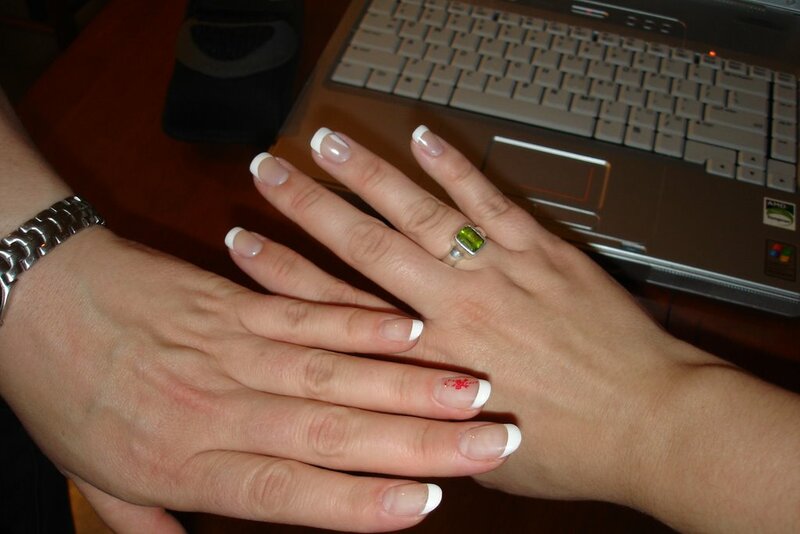 I have never had nails this long -- or this SQUARE -- in my life. They kinda get in the way. The square part I can take care of with a decent file, the fake part will take some time to grow out. I suppose it's a good lesson -- know what you're getting into and if it goes badly, time will often fix it. I struggle with trying new things, it's something I've learned about myself and I'm working on it. I guess the nails aren't the only thing that will take time. There are only a handful of days left until Christmas and around here things are certainly looking the part. The tree is up, the stockings are hung, the mantel is full and the cat is trying to eat everything. The house smells of pine -- one of the things I'm certain Heaven smells like. I sat staring at the tree so long this morning that Kendra asked if I was okay. 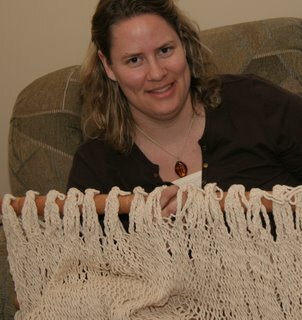 Apparently I had an eerie stillness about me. I couldn't help but think how many memories are hung on the tree each year and how wonderful it is to have such a season to unpack them. This is a mosaic of a few of my favorite things (or favorite deckies as we called them growing up). Top left is an ornament I made when I was three. It's supposed to be a bell, fashioned from egg cartons and glitter. My favorite out everything on the tree. It has crossed the Atlantic ocean and traveled the full width of North America. It reminds me of my Mom who always has time for crafts and of the magic that transforms something empty and used up into something beautiful. I always hang it near the top of the tree. Next is a snowflake I bought last year in the gift shop of Salisbury Cathedral. Salisbury dates to the 13th century -- literally hundreds of years of worship are soaked up in the stone walls. I remember being there and falling silent. A snowflake, it turns out is a beautiful picture of just that. I don't know where the robins came from, but they have always been a part of Christmas. Robins figure prominently in English Christmas cards. We had a set growing up that would get wired into the decorations in the house. When I moved out I asked to take one with me. The robin reminds me of my Dad because he used to hide the robins each year and my brothers and I would sit in the living room trying to see who could spot them first. The Disney ornament is in memory of my birthday trip this year. When I spotted it in the vastness of the World of Disney store I knew it was too perfect to pass up. What a great way to remember a perfect birthday celebration. The stocking is for my Nan, a champion knitter in her day. 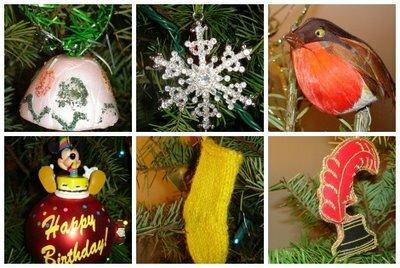 There's a whole set of these knitted ornaments -- stockings, candles, snowmen, candy canes. I have no idea how that works. My parents have a complete nativity that she knitted one year. Shepherds and staffs, kings and gifts, it's all there. The ink well is for me, a reminder to keep writing, a reminder of the power of words and story. This particular ink well was also purchased last year, when I went to visit Shakespeare House. It was the strangest thing to stand on stone flags that once chilled the little toes of a boy who would grow up to transcend the ages. Flesh does not endure, but words can. This last photo is for my family, because everyone has been posting lovely family pics and I haven't. So here you go. 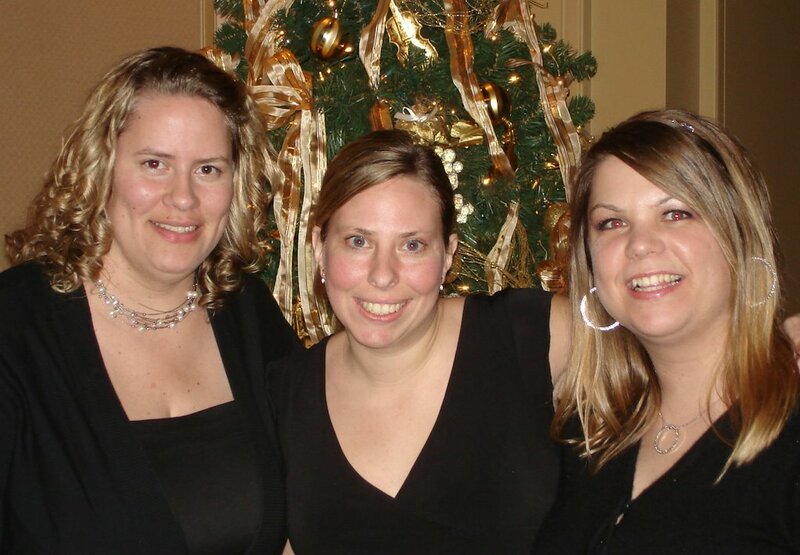 This is me at the company Christmas party with Leah & Lynnette. You can't go wrong with a black dress (even if everyone else has the same idea). I was trying to get a "festive" photo of the cat but she refused to participate. Antique bells on red rope -- she would have none of it. 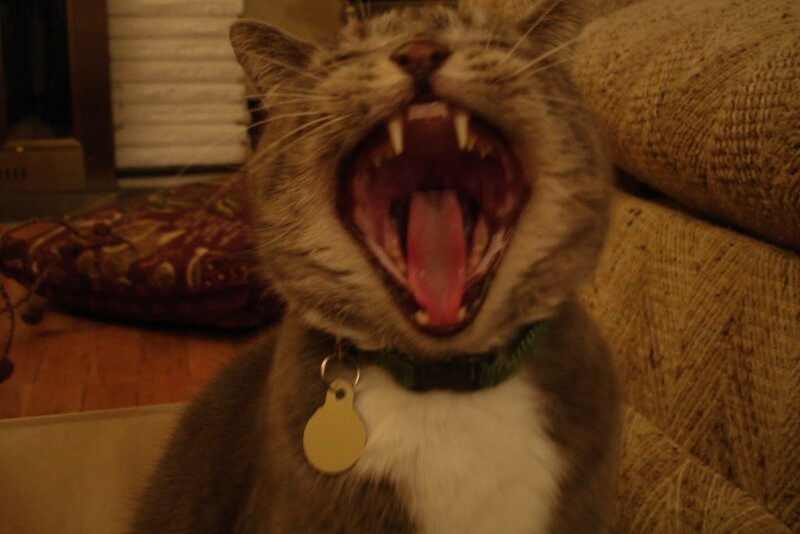 Instead I got this shot of my fierce jungle tigress 'sounding her barbaric YAWP over the rooftops of the world'. (Points to anyone who correctly identifies the quote, double points if you get the non-movie reference as well.) I took this as a sign that the photoshoot was decidedly over. 'Nuff said. In other wanderings, today I came across an interesting article about a professor who tried to prove Wikipedia was fallible. He failed. In his experiment he added erroneous factoids to several obscure articles. He expected them to last several weeks, but all 13 were gone in 3 hours. The professor conceded that the system clearly worked. Colleagues however were less convinced. One quote really struck me, "But doubters of the approach -- and in academe, there are many -- say Wikipedia devalues the notion of expertise itself." Are these professional academics really saying that knowledge has no value in itself? Are they claiming that expertise only matters if I have it and you don't? How can knowledge lose value by being shared? Surely the only useless knowledge is that which is hoarded and kept private. I wonder if they're speaking out of fear? Do they think that Wikipedia will one day replace the universities (they way the naysayers predicted television, or the internet for that matter, would wipe books from the face of the earth)? I can't understand teachers that root for less information, less knowledge. It's such an ignorant position. In a very strange congruency, the idea of prosopagnosia (face blindness) has come up a couple of times over the past few days. First it was the case du jour on this week's 3lbs (a show I doubt will make it past mid-season, but it stars Stanley Tucci so I'm watching anyway). Then it popped up again in the November issue of Wired. 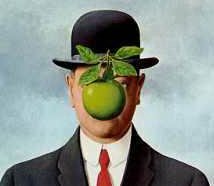 What must it be like to live in a world where the faces are no more recognizable than the famous apple-obscured bowler wearer in Magritte's Son of Man? The Wired article talks a lot about the isolating aspect of the condition. Imagine not being able to recognize your own face, not realizing when the love of your life just walked into the room. Think of conversations without the benefit of expression or any facial clues. What a confusing world that must be. There is so much emotion wrapped up in the idea of faces -- everything from recognition, to communication, identity. It's a big part of the world to be cut off from. I'd imagine it feels like losing half of your words. In Orwell's 1984 there's this whole idea that you can curb thought if you simply remove the words to express that thought. I wonder if someone born with prosopagnosia would be less likely to use facial expressions having never seen them communicated? Years ago Discovery Channel did a series on how the brain processes faces. In addition to face blindness there were people who could only focus on one part of a face at time and could not put together the whole. There were others who could see the face but could not attach emotion to it. I remember one young man who was convinced his Mom had been replaced with an actress who looked just like her. He recognized the face but felt nothing for her. There was still one more who could see faces but could not distinguish a new face from one he had encountered before. It must be a particularly heavy burden to have to keep introducing yourself to someone who loves you. There's such a strong element of selection in love -- I choose to be with you and no other -- would that choice, and thereby that love, be questioned if there was always a moment's hesitation before he or she moved towards you? Heavy questions for a Sunday night. I did my first year of University as a pre-med student (and graduated with an English degree, long story). I remember taking a course on Brain and behavior that year. We didn't cover prosopagnosia, I wish we had, but it was fascinating how much we still don't know about the human brain. We can get all the way to the moon and back, but cannot travel all the way into our own heads. I wonder if it's for our own good.